Use your keen and quick wit to spot required configurations and unlock bonuses. At the completion of each new challenge, earn colorful crystals to buy upgrades in the shop. Spells are at your disposal for even more points. As you go deep into the world of sparkling gems and royal bounty, you can't resist the attraction of growing your colorful treasure more and more.Keep your slot machine full for continuous upgrades! Download free full version game and try this dazzling and addictive match 3 game! Free Game features: - Play eight enchanting episodes in more than 10 hours of gameplay; - Create gem collections in 160 unique levels; - Activate eight exciting bonuses and five fantastic upgrade levels; - Beat the clock and complete collections within a designated number of plays. 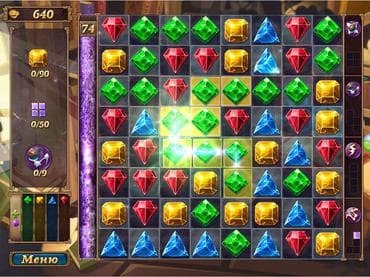 If you have questions about Royal Gems game, please contact us using this form.